Beginning in January, you can get an Easy Advance* up to $6,000 at M&M Tax Service. Yes that’s right; Easy Advance* loans are available this year! With the IRS announcing they will be holding tax refunds of early tax return filers who have children until February 15th or later, you may need this money now. Many times we see people that count on their early season tax refund check to catch them up on their bills after the holidays. Apply Now! Get an Easy Advance* up to $6,000 beginning January 2nd, when you choose M&M Income Tax Service to prepare and file your income tax return. 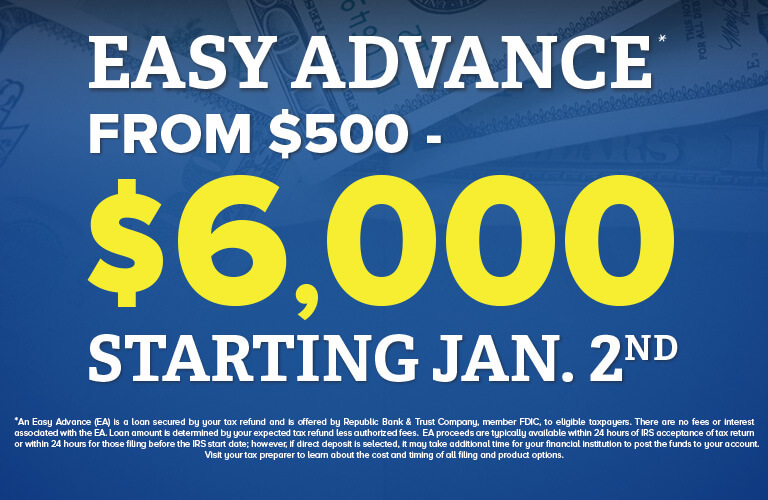 That’s right, get an Easy Advance* up to $6,000 beginning January 2nd. Tax advance requests are approved or declined based on prior year tax refund history and information on your current year tax return. Money is typically available within 24 hours or less. Easy Advance* loans are available beginning January 2nd.